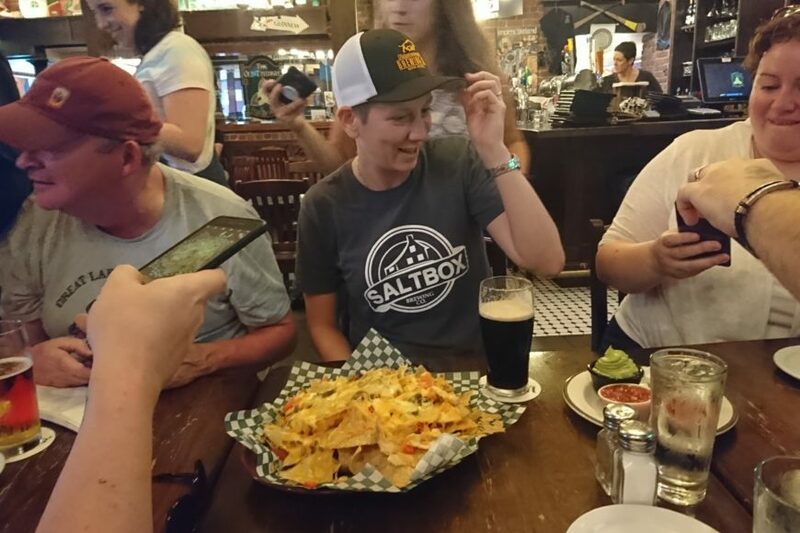 The first Nacho Quest took place in 2014, when I first recruited a team of random internet strangers to come along on one of my crazy food quests! 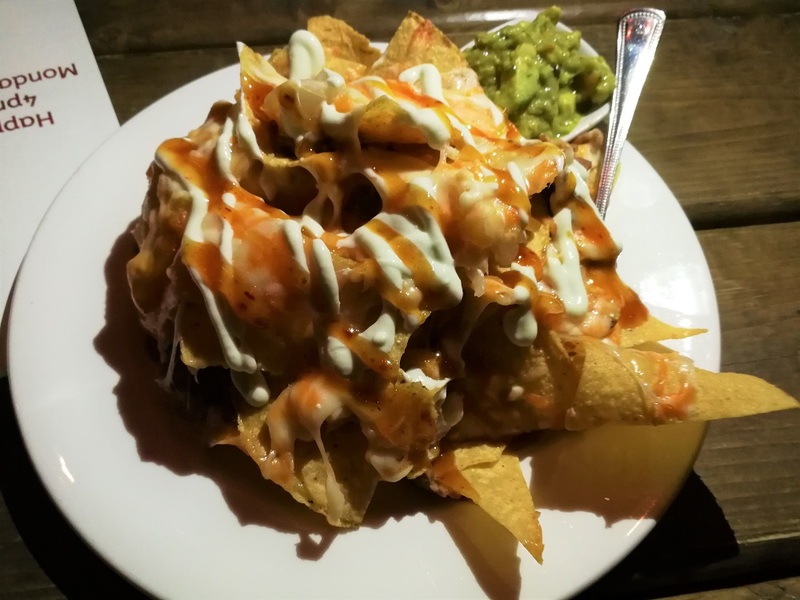 The plan was to bar hop to every restaurant on Spring Garden Road that served nachos, and score each plate on a list of criteria. Over the last 5 years, I’ve organized 9 Nacho Quests, accounting for the entirety of the Halifax Peninsula. Street-by-street, neighbourhood-by-neighbourhood, block-by-block; where there were nachos, we were there to conquer! 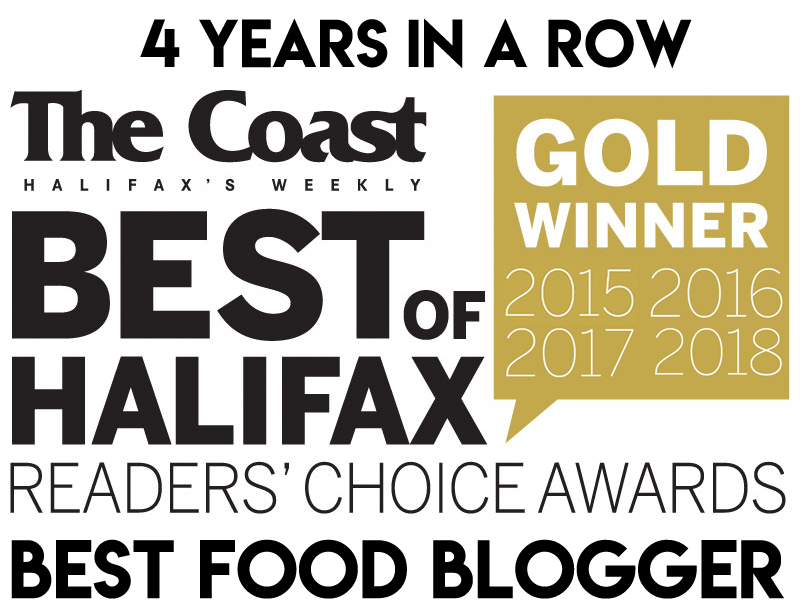 I decided that 2018 would be the year that I would wrap things up and decide once and for all: Where are the best nachos in Halifax? 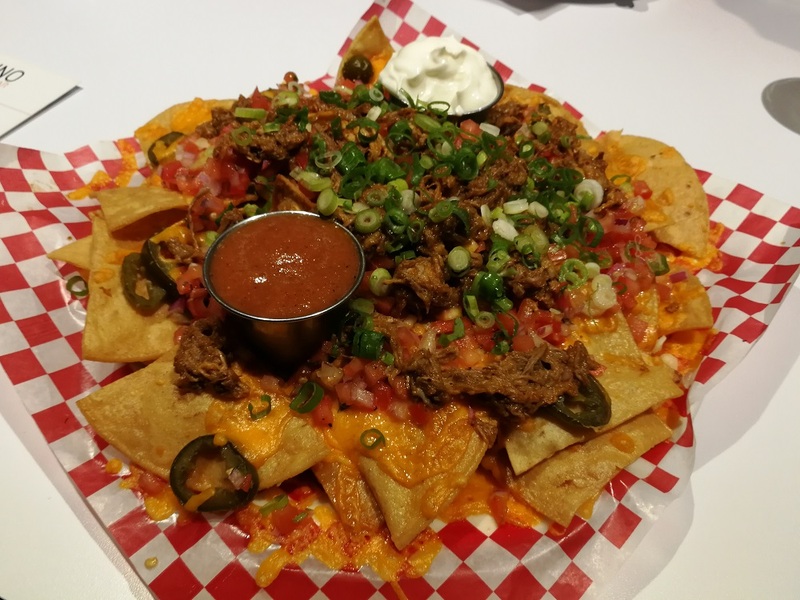 I enlisted an entirely new Nacho Team, composed of friends and strangers who had never been on a Nacho Quest, and sent them with their fresh, untainted palates, on a 2 day quest to rate the top 10 ranking nachos. “The B Team”, as they call themselves, consisted of 8 worthy heroes: Jeff, Jacqui, Abe, Matt, JC, Sharon, MJ and James. The toppings are bright, tasty and well distributed, but there is a serious lack of heat. The team characterized the “Rosa sauce” as more Italian than Mexican, belonging on pizza or pasta. Pro-Tip: request the house-made jalapeno relish. It’s not mentioned on the menu. At $15 these are a bit steep for the quality/size, and it’s problematic that only one dip is included. 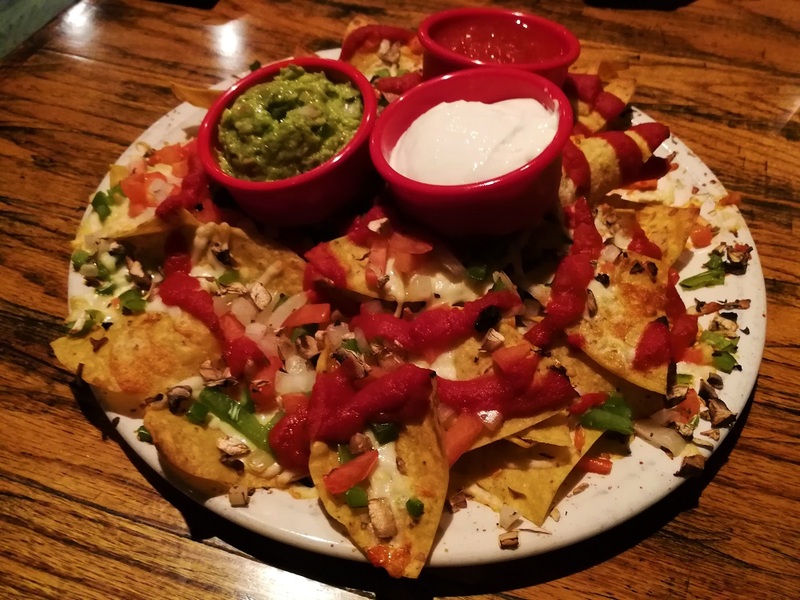 These blew away the competition on past nacho quests, but they didn’t wow the B Team. Triple-decker nachos with layers of cheese, black beans, corn, onion and shredded cabbage. There’s a tantalizing “secret spice” on the chips and a sriracha oil drizzle. The B Team felt these nachos weren’t cheesy/melty enough! I hate to say it, but I think the team would have been more forgiving of the too-much-cheese version than the not-enough-cheese version. 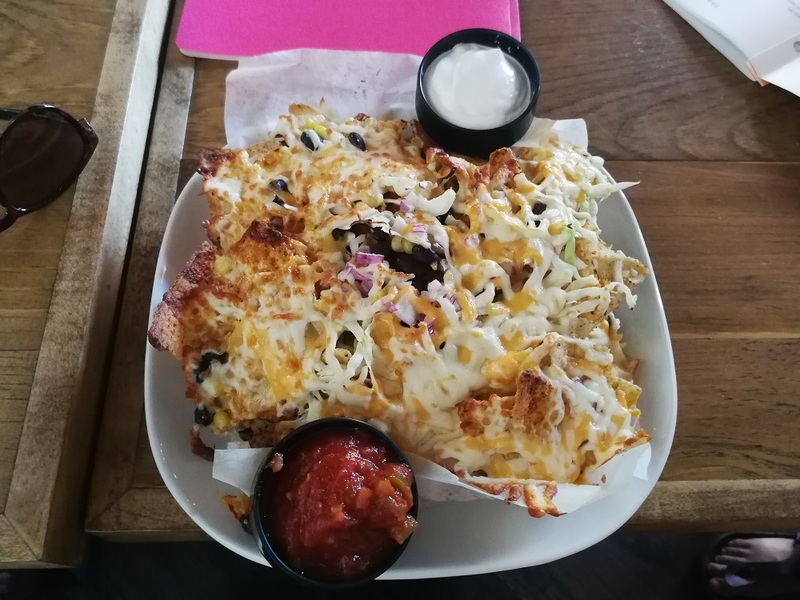 One of their issues was that the nachos were unevenly cooked, and I think the recent addition of cabbage exaggerates the visual effect of par-cooked cheese strands. While the cheese factor did not wow the crowd, the overall flavours and ingredients were pretty solid and it’s a decent portion for $12. Two distinct cheesy layers with beef, peppers, tomatoes, onions, kalamata olives, & jalapenos. These nachos had excellent topping distribution and a solid, if not perfect, attempt at layering. Most of the flavour came from the seasoned beef and briny olives. Otherwise these are pretty average, but solidly average. A single layer of chips, carefully dressed with diced red & green pepper, tomatoes, green & red onion, chopped spinach and jalapeños and covered in mozzarella. Includes: sour cream & salsa verde. Extras: Guacamole ($3). Stingin’ Hot Honey ($0.50). These nachos had a perfect cheese coverage, though some would have liked to see more browning or a bolder blend of cheese. 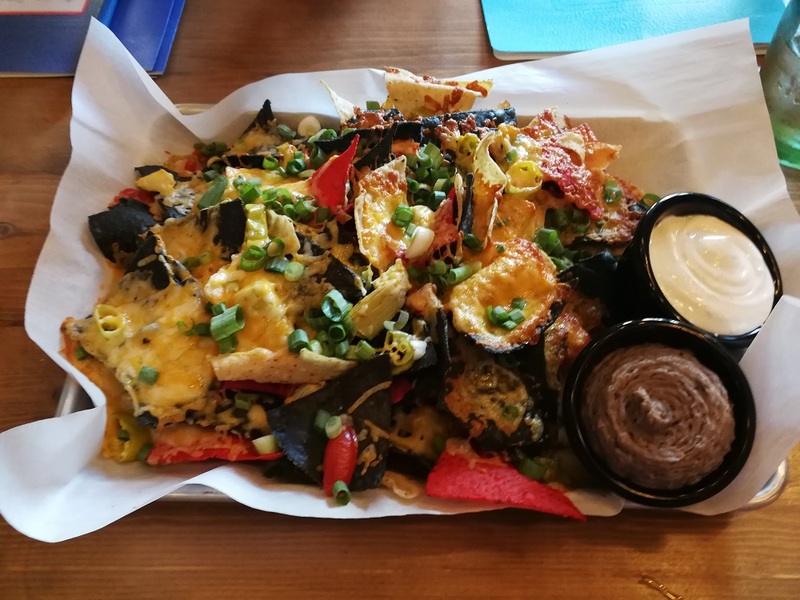 One of my favourite things about these nachos is the tiny diced fresh jalapenos, but they weren’t well dispersed on this particular platter and not everyone detected them. Mozza is not the boldest of cheese flavours, and without the jalapeno distribution these nachos came across as sorta plain. The house-made salsa verde is a nice departure from the usual Sysco salsas we’ve encountered, but I wish they’d bring back the donair dipping sauce option, as it worked really well with the mozza. These nachos are decently priced, but the group felt they were a bit small. Personal-sized nachos served in a quirky metal lunch box, with pickled jalapenos, diced tomato and green onion ribbons. 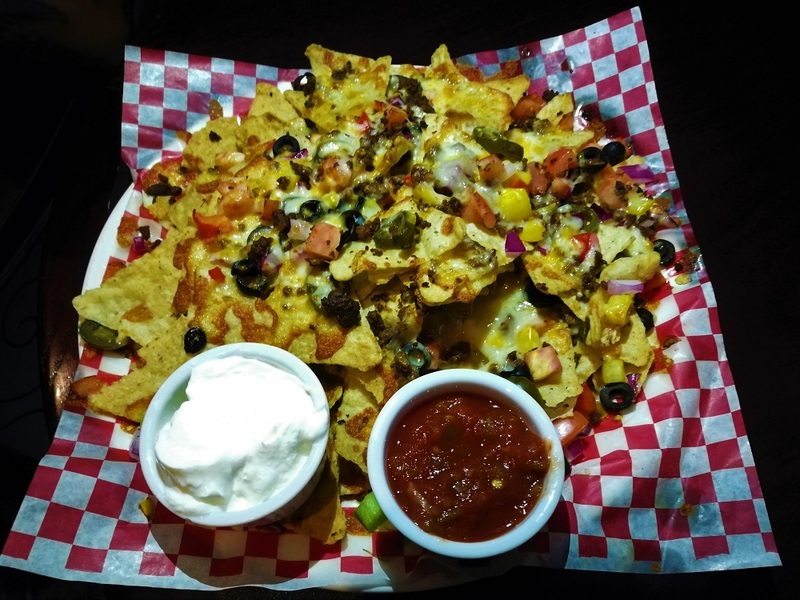 These are the smallest, cheapest nachos you’ll find in Halifax. Sure, they’re a bit gimmicky, but they’re also quite good. They are cheesy and flavourful, with a bit of flourish. Most everyone would recommend you add the beef for a grand total of $8. They would probably be great even without the beef, if you were looking for a cheap snack. However, the guacamole is a very small portion of tube guac, and not worth the $3. 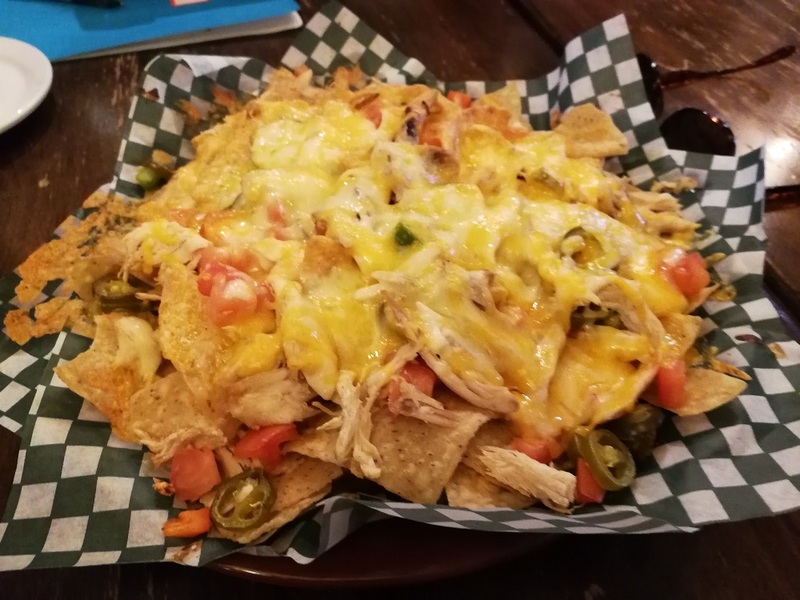 A nice portion of layered nachos with the expected pub toppings (jalapenos, tomatoes, onions). Corn chips are bagged but fried in-house for extra freshness and loaded with a blend of pre-shredded and house-shredded cheddar. 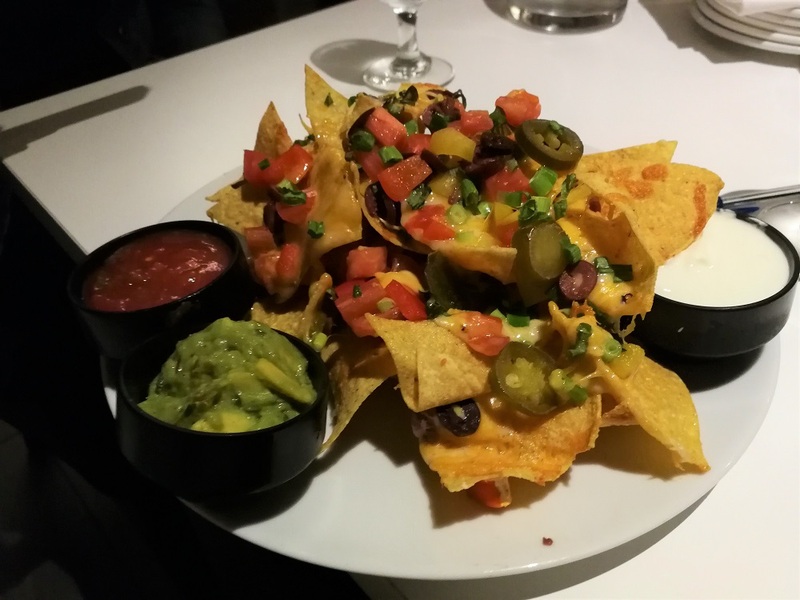 Team B thoroughly enjoyed these nachos, with their perfect cheesy layers. While the toppings are average pub toppings, the chicken is actual chicken, hand-pulled off the carcass. It’s actually house-roasted chicken and 1000 times better than the diced Sysco chicken breast you get at most places, even if the team felt it lacked seasoning. The salsa is pre-fab with house-additions, fresh tasting with a pop of cucumber. These are a generous portion for $14 – opinions are split regarding the $5 chicken addition. A perfect structure of chips and melted cheddar, with house-smoked brisket and sauerkraut. Drizzled with green onion crema and chipotle honey mustard. The layering was absolutely perfect; a flawless structure glued together with cheesy goodness. Judged on technical merit alone, these nachos are an almost perfect score. However, the team noticed that the brisket and sauerkraut were a bit sparse. The crowd was impressed with the intricate layering and the wonderful guacamole. Can’t argue with the price for such an elaborate work of art. We’ve arrived at the top 3! 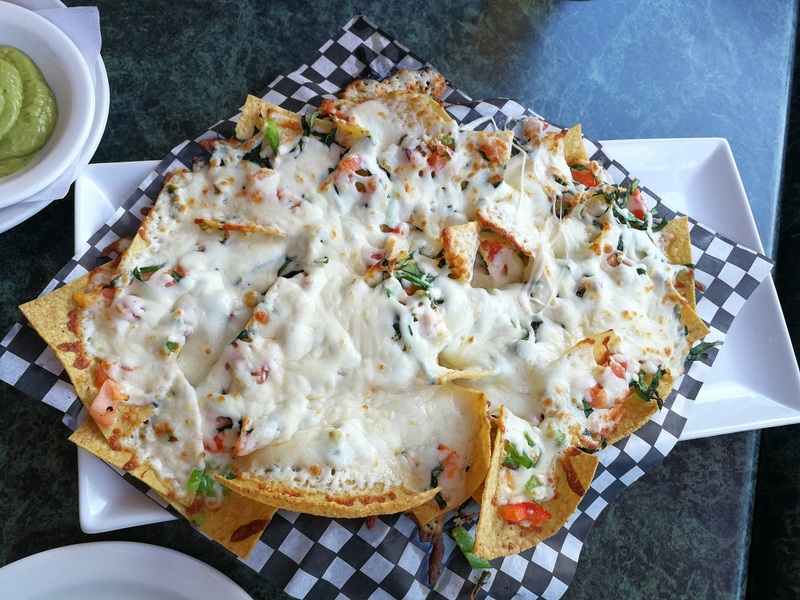 The following restaurants have consistently demonstrated their ability to provide quality ingredients and traditional nachos flavours in a relaxing environment with fantastic service. With no further ado…. A medium-sized platter of tri-coloured chips, layered with decidedly non-Mediterranean flavours: pickled peperoncini, artichokes, tomatoes, green onions and a blend of mozza, cheddar and jack. The layering is imperfect, almost elusive; some noticed the attempt while others did not. An adequate amount of cheese, but everyone would have liked more. The group loved the “inventive and thoughtful” toppings with their balance of sweet & heat, but would have liked more toppings as well. We love these nachos! Give us more of everything! Please? k thanks. What really set these nachos above and beyond were the dips: the habanero lime sour cream and the black bean dip. Put it all together and the overall flavour won everyone over. Perhaps $17 is a bit pricey, but we think it’s worth it. A lovingly layered stack of cheddar cheese, kalamata olives, tomatoes, peppers and scallions. We love it when guacamole is included in the price, especially when it’s house-made, and at $12 these nachos are an absolute steal! Weaknesses: None. Okay, the salsa was just average. Fresh white corn tortilla chips (flown in from a special producer in Toronto) fried fresh, and topped with house-grated medium cheddar cheese. Topped with house-made pico de gallo, green & red pepper, jalapeno and green onion. Crowned with a beautifully spiced, slow-cooked pulled pork. Includes: sour cream and house-made salsa (“jalapenos and onions charred over high heat with a hint of cumin to bring it all together”). Everybody loved the chips, the cheese, the salsa, the toppings, the pork…. and overall? Harbourstone Sea Grill & Pour House: a flavour bomb with aged cheddar, caramelized onions, and maple bacon. The Arms: a massive pile of layered cheese, scallion, tomatoes and house-made banana peppers. Tempo: an interesting concoction of barbecue chicken, pickles, feta and other lovely cheeses. I believe any of the honourable mentions could easily have been on this list, depending on the day and personal opinons. Kudos to so many hotel restaurants making this list! 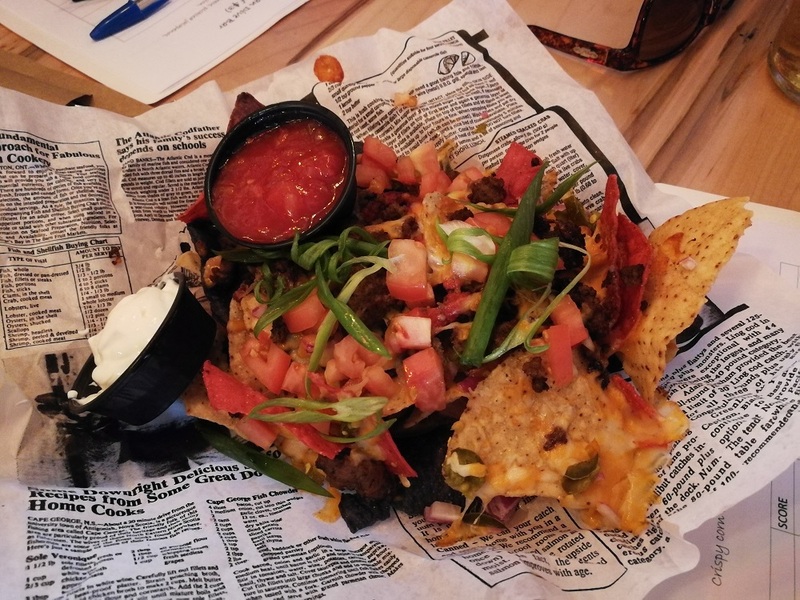 Want to know what it’s like to go on a Nacho Quest? Hit me up to be an official nacho quester! I’m also thinking about offering The Nacho Quest for private bookings. If you have any interest, please contact me and we’ll work something out! 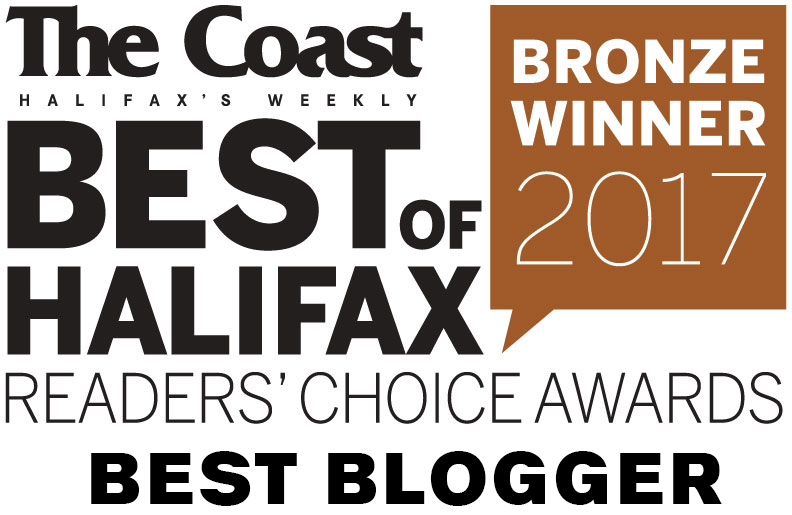 If you read the post, you would know that this was only a quest of the Halifax Peninsula. I hear lots of good things about Now We’re Cooking.